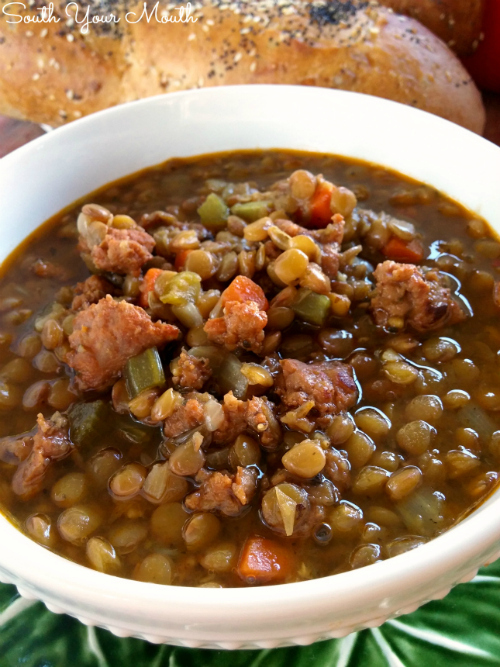 A lentil soup recipe with spicy Italian sausage loaded with lots of garlic and herbs. 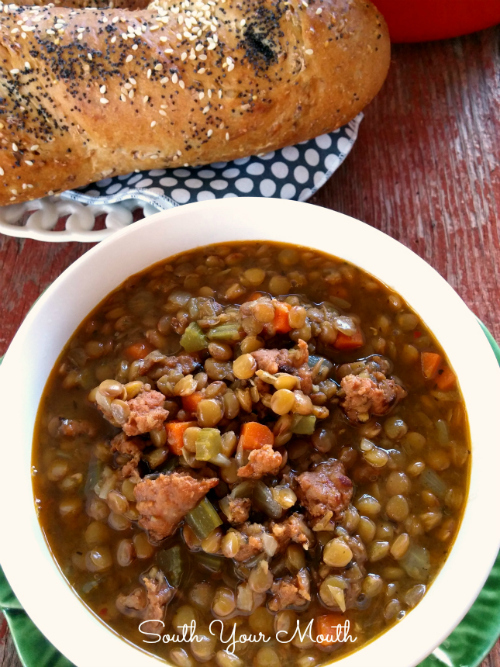 Tastes even better than Carrabba’s Spicy Sausage and Lentil Soup recipe! 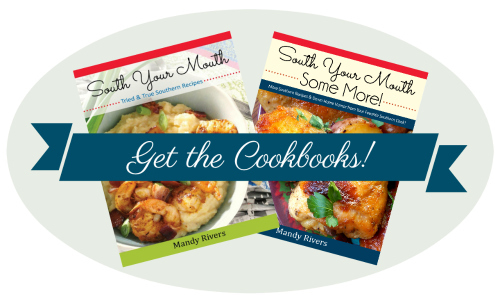 When I went to hock my cookbook on QVC I decided to take Mama with me since I’d have a few days to kill in Philly. I figured it would be a fun way for us to spend some time together. I was right! Side note about that – David Venable is a riot and QVC is a class-act all the way. I am a forever-fan of both now. If you didn’t know (I didn’t), Philadelphia has an awesome food culture (beyond cheesesteaks – though they’re worth the trip all on their own). If you’re ever there, you have to scratch out some time to go to the Reading Terminal Market downtown. It’s an indoor market that takes up an entire city block that's filled with food venders (think food trucks meet farmers market) with every cuisine and culture you can imagine and then some (from Ethiopian to Amish). You can sit down to a bowl of pho while admiring a wall of peking ducks at one stall then turn around to buy a bag of freshly baked chocolate French croissants at another. IT WAS HEAVEN! One of the things I ate on my trip that really made an impression was a bowl of spicy sausage and lentil soup. I’m not even sure if I’d ever even eaten lentils before but one spoonful of that soup and I was hooked! 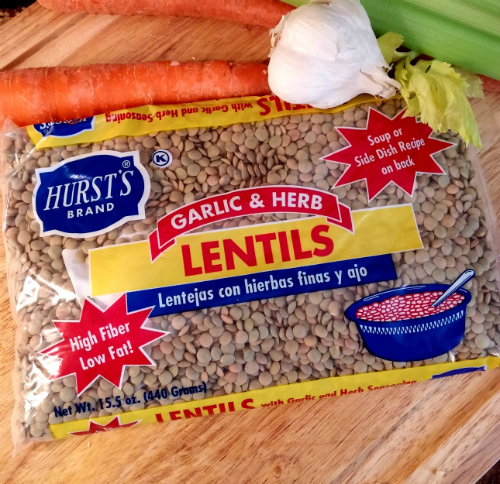 So when I spotted the Garlic & Herb Lentils from Hurst’s Beans, I pounced on them. As much as I like peas and beans I can’t believe it took me so long to try my hand at lentils. They’re super easy to cook and the kids lap them up because they’re so much smaller than beans, they don’t even realize what they’re eating. Fiber and protein, y’all! Holla! If you haven’t tried them yet, this soup is the perfect way to get introduced! Enjoy! If you can’t find the lentils in your local grocery stores, ask for them! My grocery store now carries all sorts of products they didn’t have before simply because I asked for them. Just ask the cashier who to talk to to request a product and s/he will point you in the right direction. My store has a list at the Customer Service desk where they notate products their customers' request. Remove casings from sausage (if applicable). Brown and crumble sausage over medium to medium-high heat in a Dutch oven or large pot until cooked through (take care not to let the pot scorch or burn). Using a slotted spoon, remove sausage from pot and set aside. Add olive oil, carrots, onion and celery to pot and sauté until onions become translucent (about 4-5 minutes). Take a picture so you can show your friends you just cooked a classic French mirepoix. Boom. Add chicken broth, water, lentils (with seasoning packet) and sausage to pot and bring to a boil. Once boiling, reduce heat to medium-low, cover, and cook for 40 minutes or until lentils are tender. Turn off heat and let soup rest, covered, for 20 minutes before serving. You can use ground beef, pork or turkey instead of the Italian sausage but you’ll need to season it liberally (suggest salt, pepper, fennel seeds, garlic and oregano). I went with a small dice on the veggies (about 1/4 inch). If you’re looking to recreate Carrabba’s Spicy Sausage and Lentil Soup, add a can of petite diced tomatoes (with juice) and reduce the water to 1 1/2 cups and I think it would be a bang-on copycat recipe. Seriously. I don't know if you can cook this in a crock pot. I would think so but I'm not familiar enough with lentils to say for sure. I'd guess and say cook on High for 3-4 hours. This is almost exactly how I make my lentil soup except that when it is done I have always used my immersion blender to make it thicken and smooth out. I would guess with your version though you would have to add browned sausage as a stir in at the end so it would not end up pureed baby meat. Ham is a great seasoning for this also. Okay. You've convinced me to buy some Hurst's Lentils. I think I could live on soups alone during the cool months ! My husband makes the best cream soups I've ever eaten. Any cream soup you can name, he has made for us--even cream of Romaine soup ! Thank you for the beautiful photos and the recipe. Made this on the week-end and it is delicious! I live in Canada so didn't really try to find the recommended lentils. Used 1 cup of dried lentils, rinsed, and soaked overnight in cold water. Followed the rest of the recipe exactly as you wrote. I did use the canned tomatoes and added extra garlic power, onion powder, celery salt and Italian seasoning to substitute the seasoning packet in the Hurt's package. Im a vegetarian cooking for me and my boyfriend who loves meat...I was wondering if I made this recipe with vegetable broth and added the sausage at the end after I separated some for myself would it still work? Or does the sausage have to cook in the soup as well? You can cook the sausage separately in a pan while the main meal is cooking and set aside for the "non-veggie" portion of the dish. After you're ready to serve, add the sausage as needed. It should be cooked and ready to eat by then. Sausage only needs to get up to 140* or so to be done and you'll know when it's browned. The sausage does impart a bit of spices however, so you may need to add something to your veggie portion (before eating) if you wish to spice it up. I recipe I've used for many years (25) has one little addition at the end. Add about a tablespoon of vinegar (red wine, apple, or balsamic) at the end. my experience is that adding anything fresh works.